Very interesting object...whether or not the interpretation is correct. Not much today, close up look at a dust devil, and a sunset. 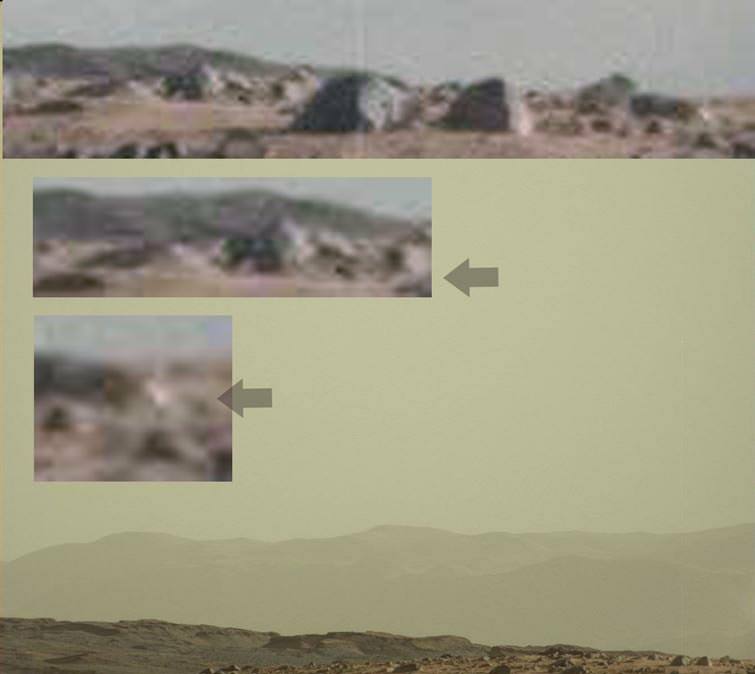 This appears to be showing a huge dust devil behind the rover, which is dragging up quite a lot of martian soil. And this one, in which the martian sun is still setting, (yellow sun) inbetween the clouds. There also seems to be the same or most likely another dust devil here also, but whiter and dissipating. That thing that really does look exactly like a tree is by far the strangest, yet most identifiable thing I've seen posted here. They most definitely should figure out what the heck that is. If it's really a biological, then we need a closer inspection ASAP. Great find. Yes that's post 523 above you're referencing I think. 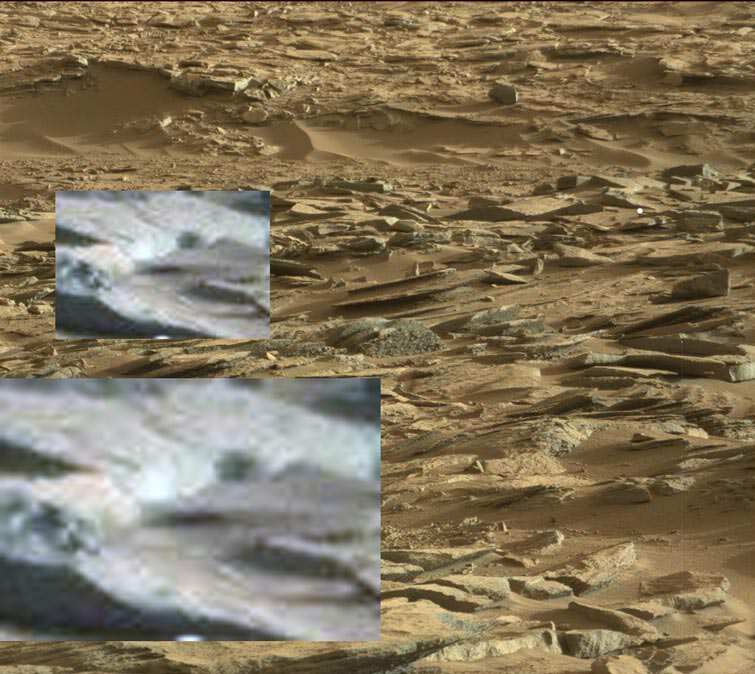 I looked at the original image on the NASA site and zoomed in several times. 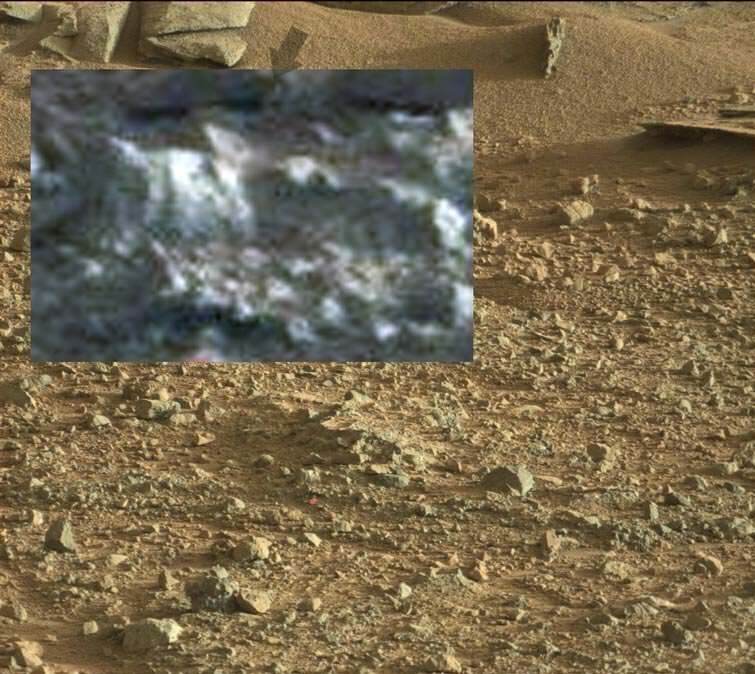 It definitely looks real, rather than an artefact or a case of pareidolia - although of course one can never be 100% sure owing to the orange filter NASA uses and the possibility of objects randomly creating an effect. 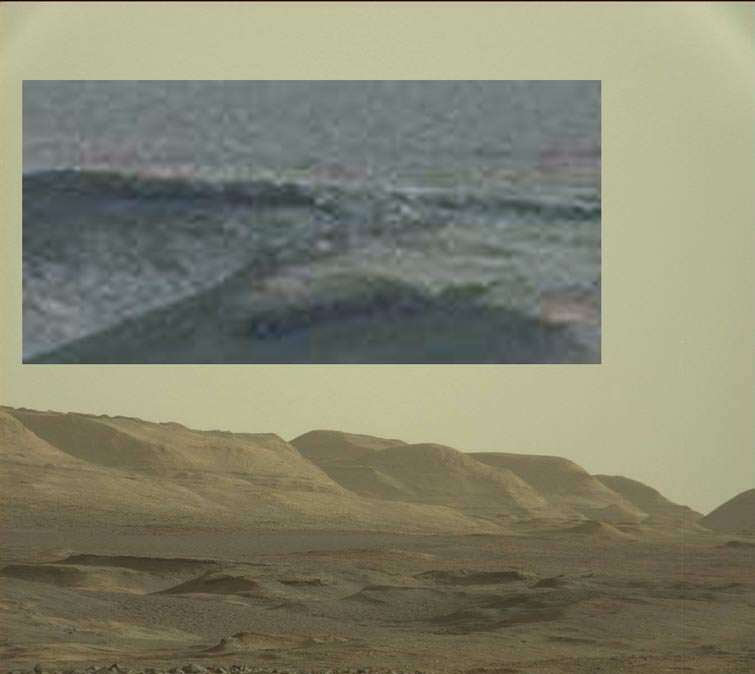 It certainly is one of the most interesting and arresting images to come from Mars. 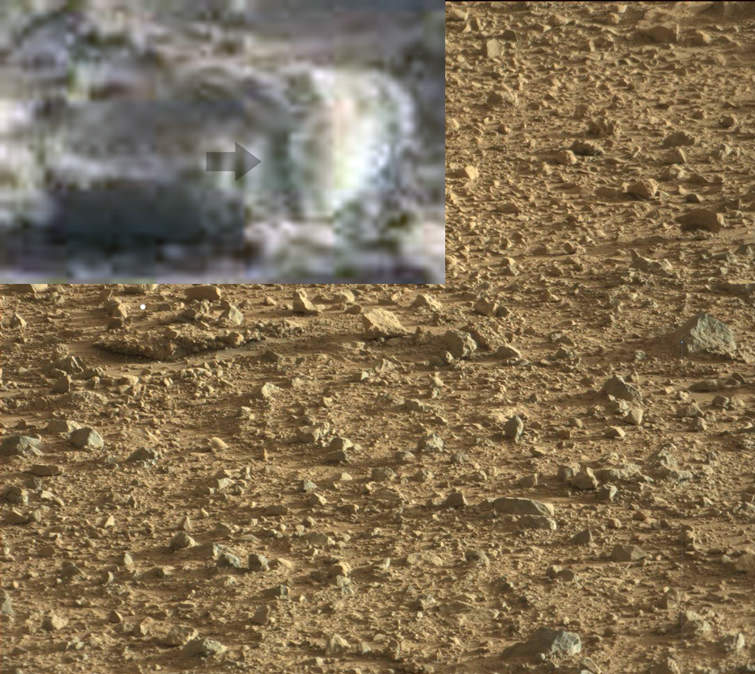 One of the most interesting aspects it that the sand or soil around the "thing", at the base, appears to be disturbed regularly, in a sort of circle...as if this thing has risen up and broken the surface. 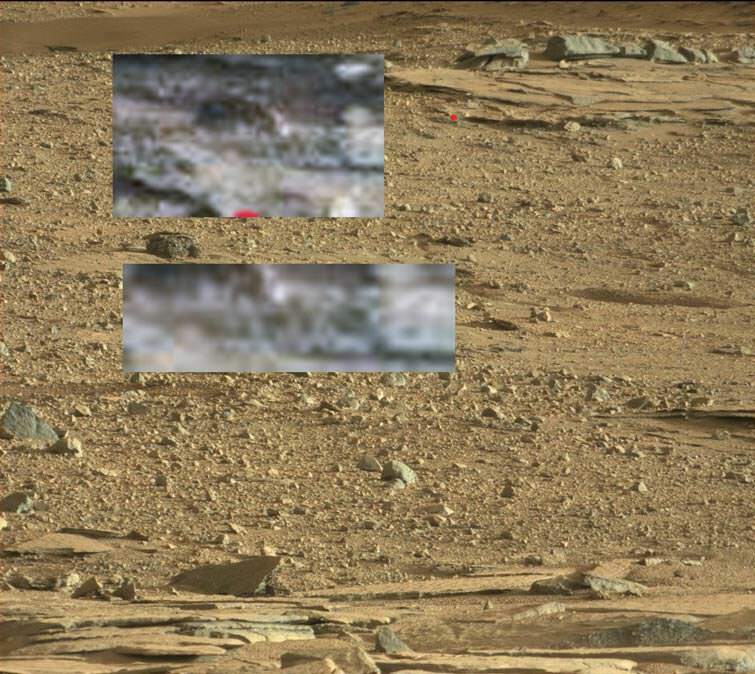 We could be looking at the first identified plant on Mars. If so M Albion ought to take some credit! Where are they? I'd like to hear if they have any more observations. Well plants can go dormant on Earth for decades in v dry desert areas. This might be the case here...most of the time the land might be featureless but when there is water, all sorts of things might pop up. Yes an interesting find for sure but I cannot take credit... just for the "3D" for what it's worth. The image appeared on the Giggapan site. I've looked closely too and cannot make out where the depth of field is captured (or lack of it) in the anaglyph, which is a bit of a red flag. But still, a strange anomaly nevertheless. My gut tells me it's not vegetation but looks more like an odd antenna or aerial of sorts. I suppose some odd sort of stalagmite is a possibility if it is under the rock ledge. But it is so narrow without build up at the base. As I was suggesting, if it were a life form it is not impossible this might be some method of propagating seeds via the wind, rather than it being a plant that lives on the surface. Wind force is much lower on Mars than on Earth, so you might need a bit of height to get some effective distribution of the seed. But yes, something artificial might also be indicated. Fascinating! And fascinating that NASA don't find anything interesting about it, or at least nothing they wish to say in public!! Some more clouds and plants. The top ones looks like a tree, but since the trunk shows a strong grass green it is more likely a hanging plant. 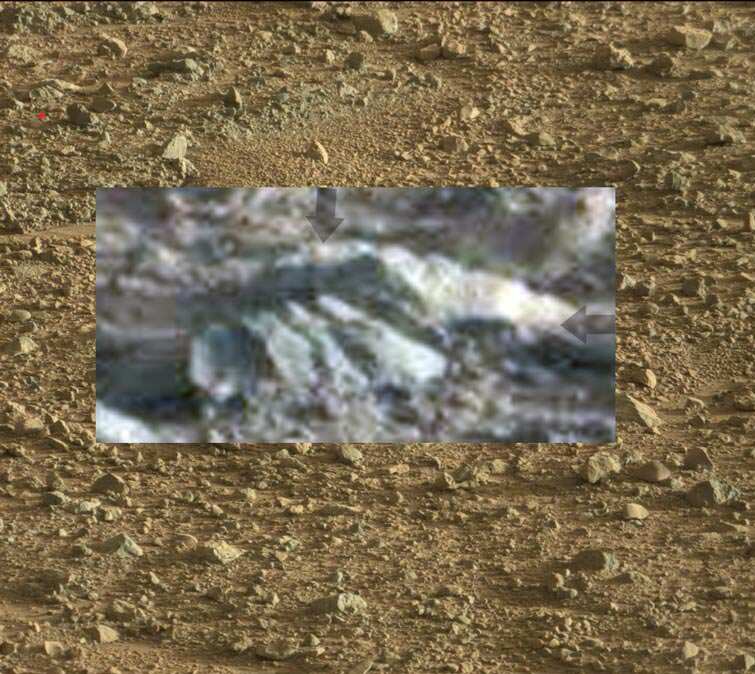 I hope you all will find my research on the Outpost Forum intriguing titled: "Life on Mars". There will be images there which have never been shown before with focus on MRO and Mars Express images. Let me state this if I may; there IS life on this planet and not just microbial. From my perspective gathered from well over 5 years of painstaking research and thousands of hours of in depth scrutiny, I have concluded that life there, is intelligent, complex, alien and quite humorous. Read through and be prepared to doubt or believe, it is, for your own personal journey, over and through the Rubicon if you so wish! Thanks Albion, l will take a squiz when l can. And l agree, NASA lying about Mars air pressure is a fact, (can't have pure water droplets or rain on the rover if they were not) or substantial evidence of plant life, (and another NASA lie about it dropping to almost -200 a couple of nights a week, which would kill of any plant life, except maybe some licken barely clinging to life). Viking landed in 77, NASA expected nothing and got organics in the soil, licken on the nearby rocks, frosts, blue sky and possibly a plant or two in the distance, got spooked by the 1957 report on most going nuts if they knew, and have tried to bury it ever since. I personally still find it amazing the most buy the "We have issues with the red filter on Mars" except they have never had any color issues with every other planet in our solar system???? Since Mars is obviously Earthlike, there is a good change of intelligent life being there now; and from what l have seen, there are three races there at present, waiting for us to ditch the oil thing and grow up. Found this, with the front structures being the rover, but the thing further back??? Looks like a silver, military hanger. 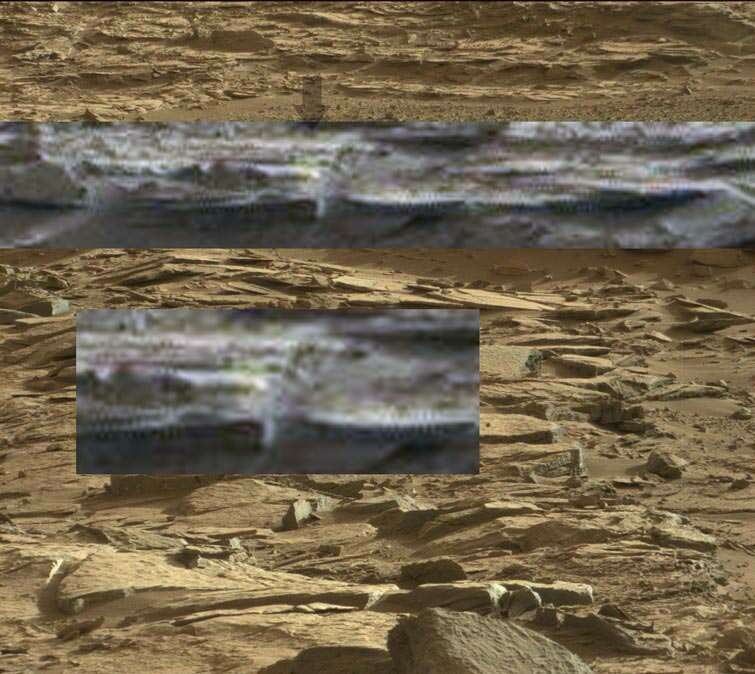 Hard to tell if it has windows, etc since it is reflecting things back to us, but since it has some weird hollow things in front of it, (probably a fence) and a large, silver structure on the right, (most likely a generator) it probably is not a human habitation. 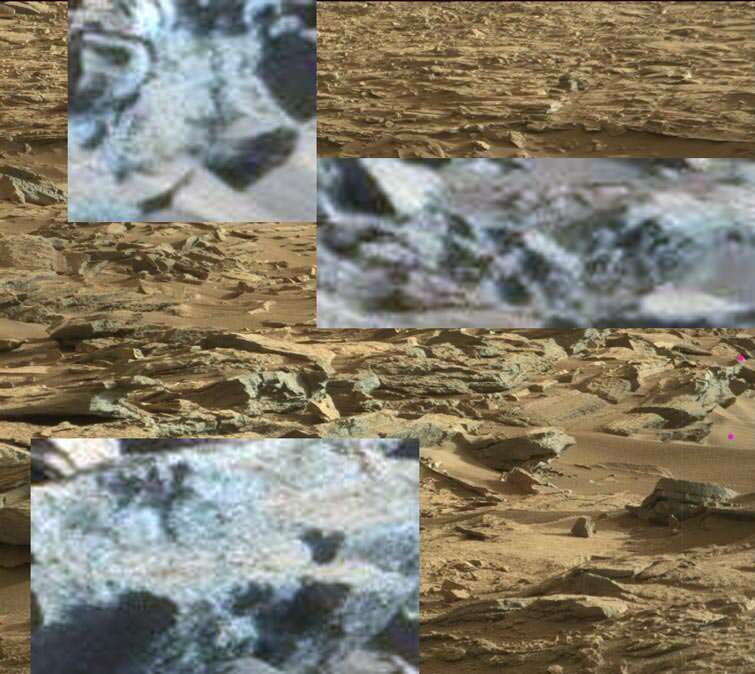 Top one is a structure, since the dark parts up the top are in front of the skyline, and it doesn't look anything like the rover, (the rover does not have any spheres or domes) and appears to be a giant depiction of a cat's face with a crown in the side of the hill. This one, l initially saw several of these ones previously and thought that they looked like telephone poles, but they are most likely old, wooden sculptures depicting something with plants growing on them. Or they may be tree's that have been artificially forced to grow a certain way, but either way the CP shows strong green so plants, moss or tree's are certainly part of it. 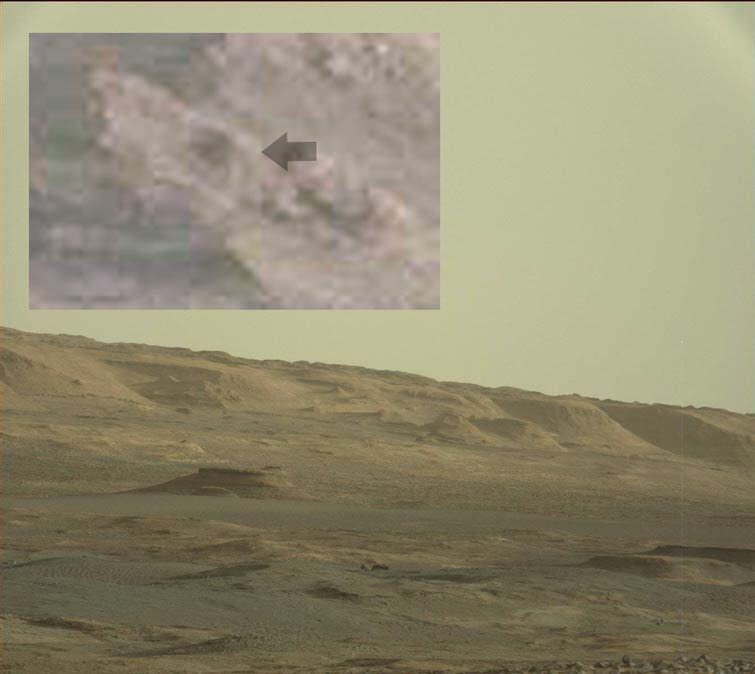 The sun is still setting, and this dark thing on the hill doesn't look like the rover. 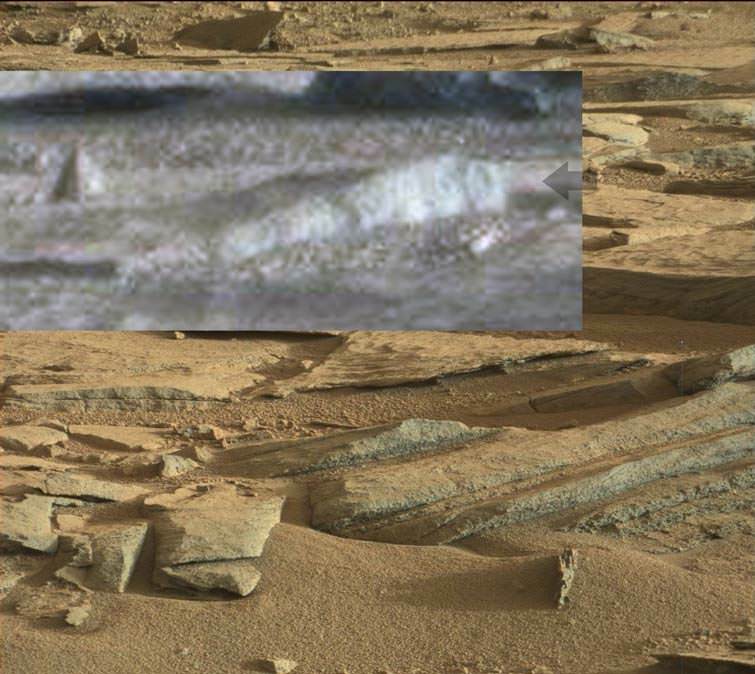 This is probably the best evidence yet of dirt roads on Mars. The things on the right, glistening in the setting sun, are most likely silver posts, possibly at the end of a bridge? 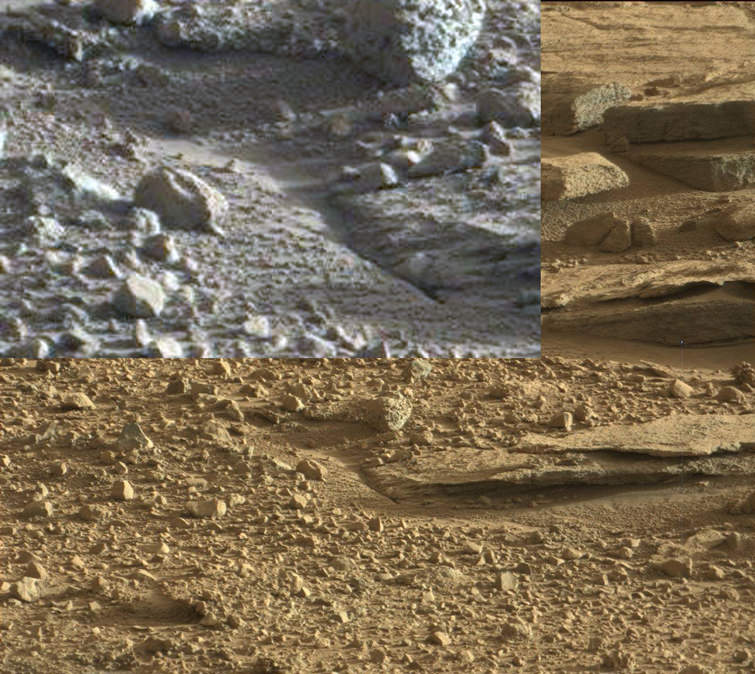 The middle image clearly shows the road curving around this hill, (most likely it is a giant depiction of a human wearing a top hat). Another good example of water runoff, (although it probably happened a week ago, this might be sand) and the impression that only water can make. 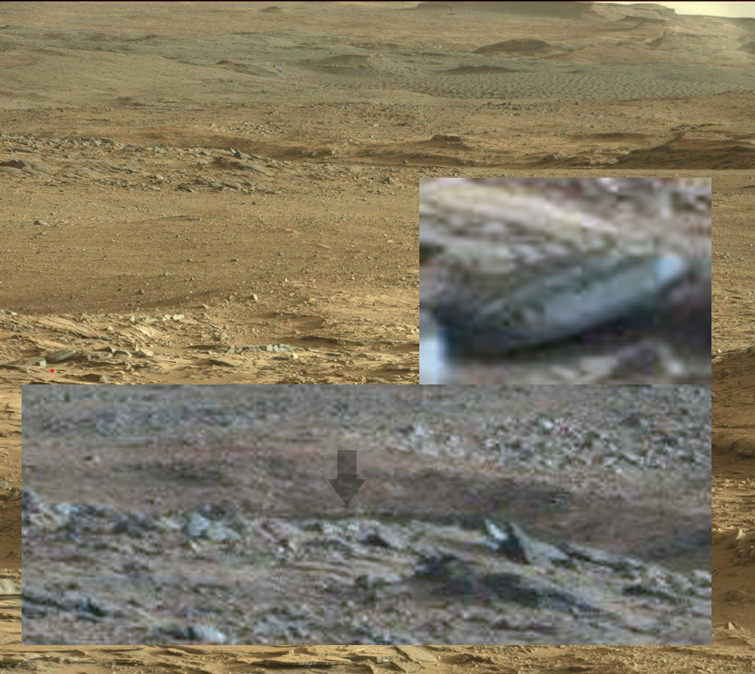 Second, another martian tree, (CP is pretty obvious) and a gray background, or rainclouds. Third another great example of a martian sunset. Yellow sun, blue sky and blue/green landscape, not the outright NASA lie of all blue, (all blue usually lasts for 10-15 minutes at sunset only. But at least they say that the methane goes up and down with the seasons, which means that it is organically derived, and not volcanic. Seasonal release of methane from clathrate could account for the variations in methane concentration, without having to invoke current biological activity. If clathrates are indeed present, we then have to account for the methane that they contain, and this might involve biology- perhaps in the distant past, perhaps not so distant! We need to go and dig some deep holes! Or hit Mars with concentrated sunlight, and see what we vaporise. Yeah, but hard to tell. I have seen what looks like a rabbit taking a sip from a pool of water, but it was just too blurry to post here. 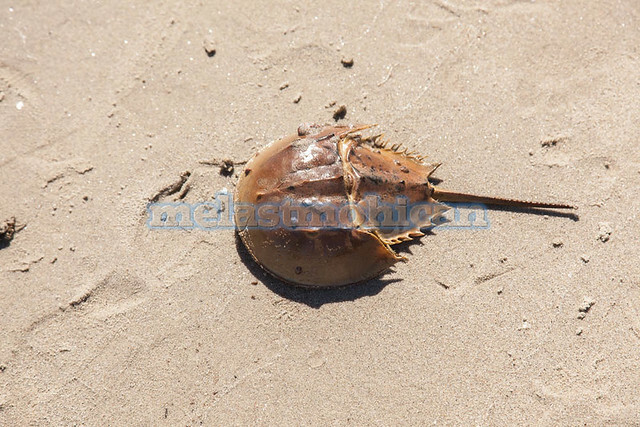 It is like pulling teeth to spot an animal, insect or whatever, although seeing the occasional footprint is easier. And unless the rover stays in the same place for long enough, most of the time any wildlife tends to do a runner when it gets near. Usual plant life in the ref, rocks. These two leaves, (arrow) have a strong, grass green color, (left does, right less so) or a slam dunk for martian Lichen or ferns. The rover has No green color. More plants, the landscape appears to be littered with these things, and strong lime to grass green is what the CP shows, although the green is clearly visible. top image rainclouds or more plants, (the landscape is misty so l am learning more towards rain). 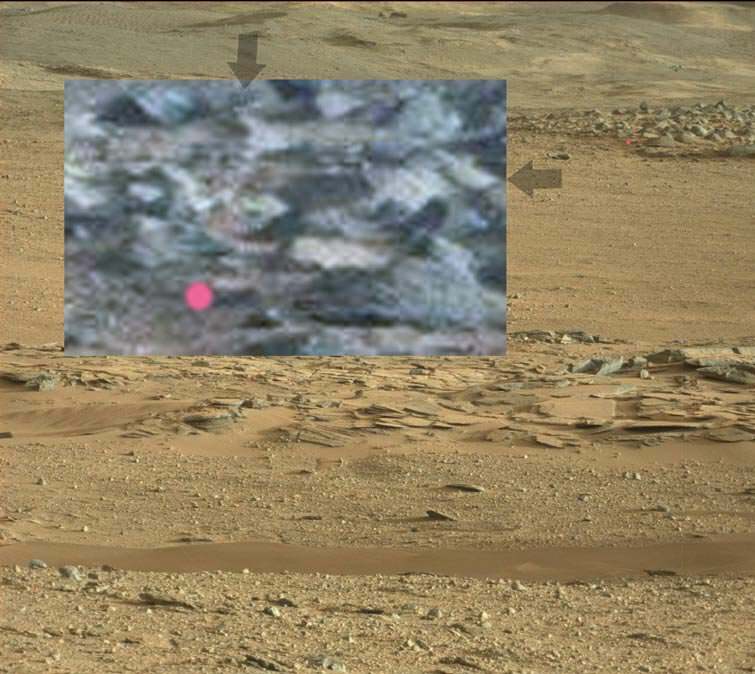 Bottom image is a gully with green, which tends to show that Mars doesn't have serious rainfall, or just short bursts, for this area; which is no surprise with orbit images showing no green. So short bursts, but not enough to fill a dam. Mars may even be in a drought for this area? But plant life growing around the base of a gully is a good indication of that idea. 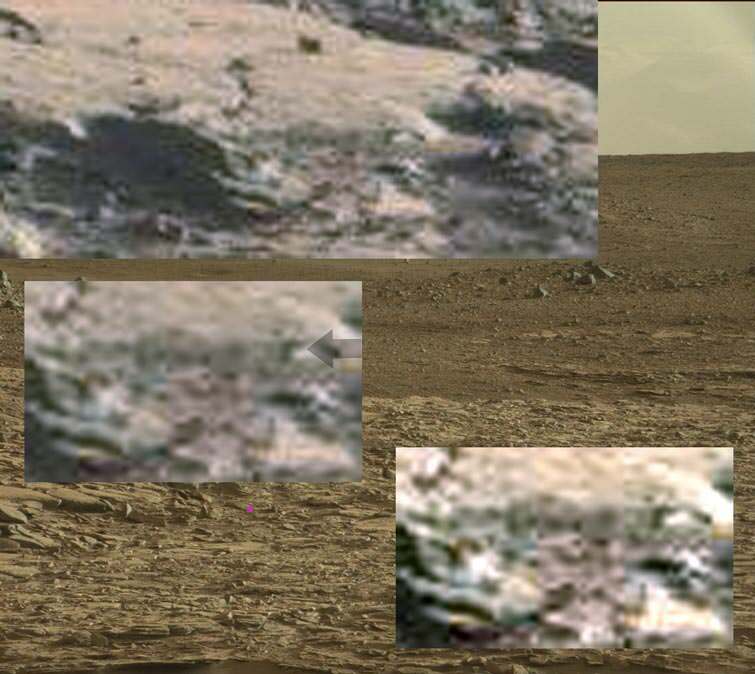 First image is some martian machinery on the side of this hill, weather station is my guess. 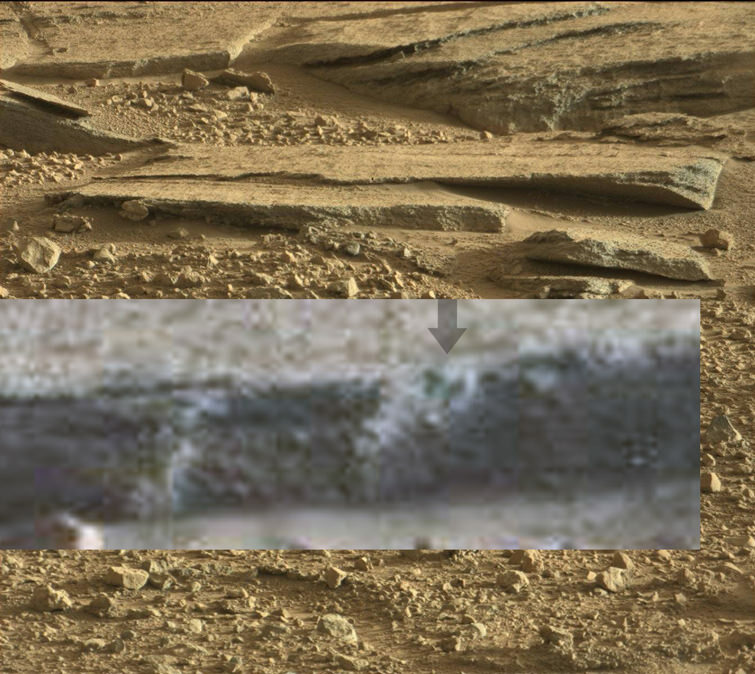 Second, l really wanted this to be a rat, but unfortunately it probably is part of the rover. 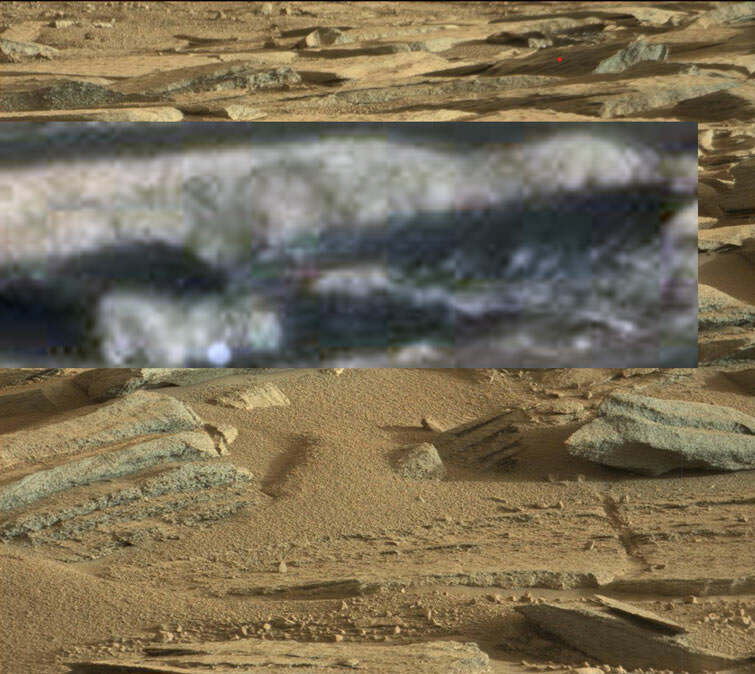 But lower image still shows the sun setting, (white dot in the middle) and a green landscape, (CP'ed it). Third, is another one of these weird plants, that appears to have the root systems growing out of the dirt, with the main body up in the air. (CP'ed this showing strong green). But the roots also show a strong green, so maybe trunks with leaves and the main body suspended off the ground. There is also another in the distance, and not sure Earth has an equivalent to this one, but evading small animals after the guiciest part of the plant is all l have. 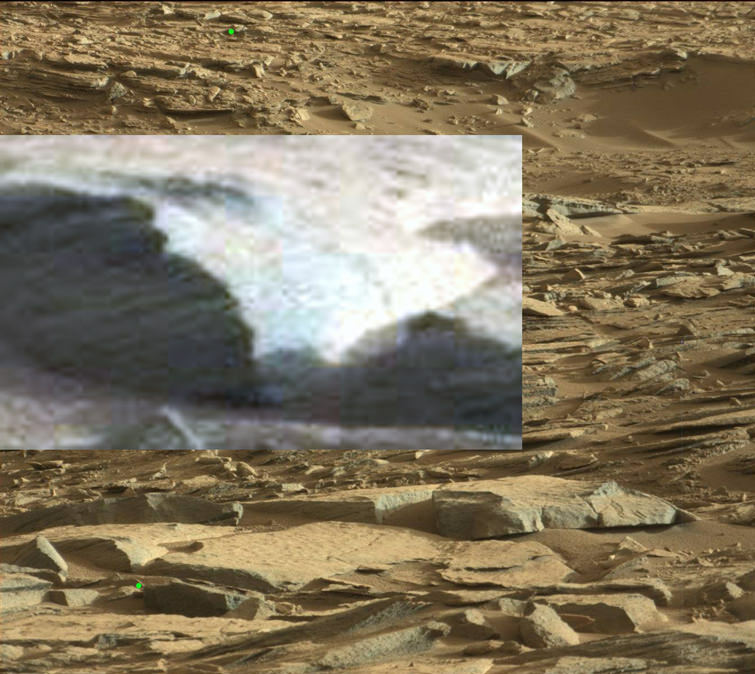 This might also show that this part of mars is dry, and it is a retaining moisture setup? 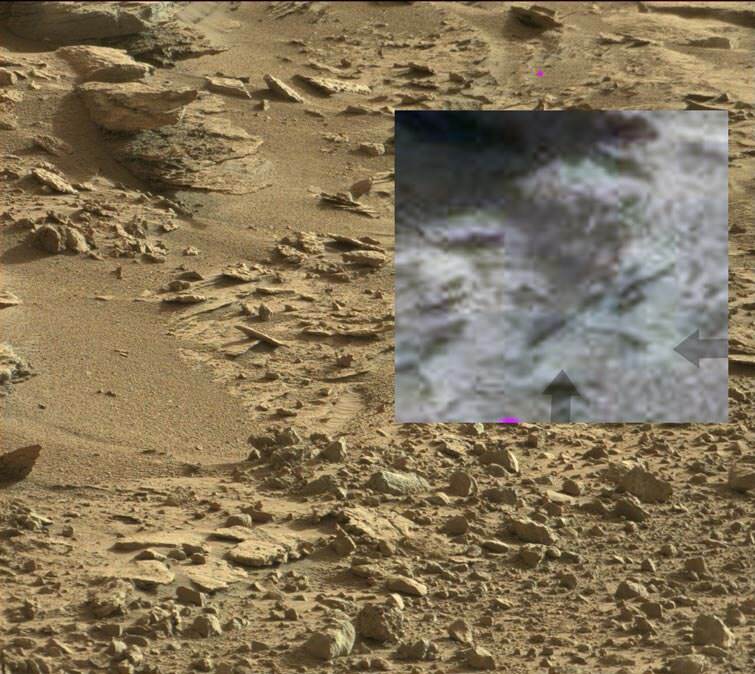 Some things on Mars will remain a mystery, least til NASA drops all of the Bill and Ben, pseudo-science, and starts giving us the truth. Not sure that this is but it doesn't look natural. Rover in the foreground, plant in the background. And this one, blue hills and setting sun in the background, plant life in the foreground. Similar one, just another ending of a partially overcast day, with a slight chance of light showers, and a white sun setting over the landscape inbetween the plant life, or small tree's. The Earth and it's inhabitants will never be the same again, once this come's out. 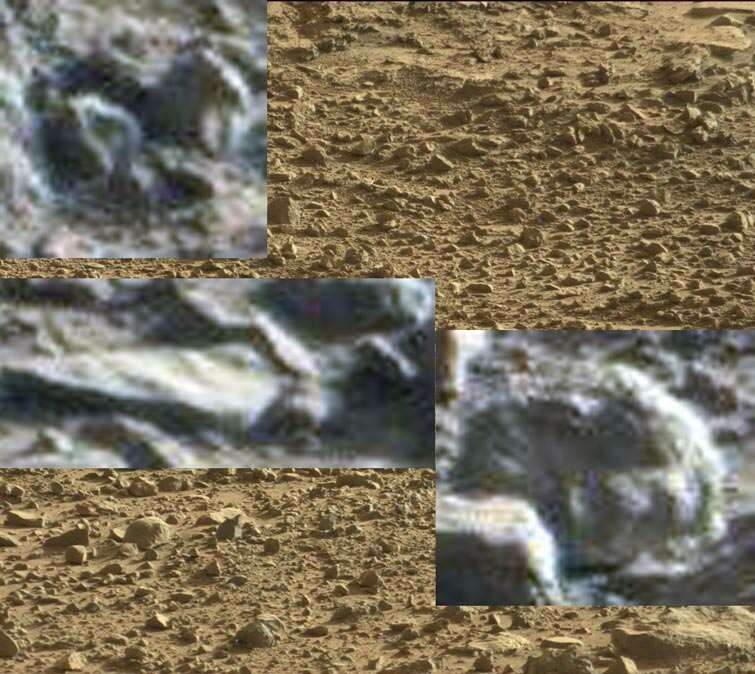 There's definitely something there and it does seem to have a skeletal form. Very, very weird. Difficult to offer any interpretation that makes sense. Certainly not your average rock. I agree the first is obviously getting past it being natural, but a skeleton not so sure since its rib cage is flat, and the upper right shoulder bone is straight or looks more like someone did a sculpture and it fell in a heap over time? 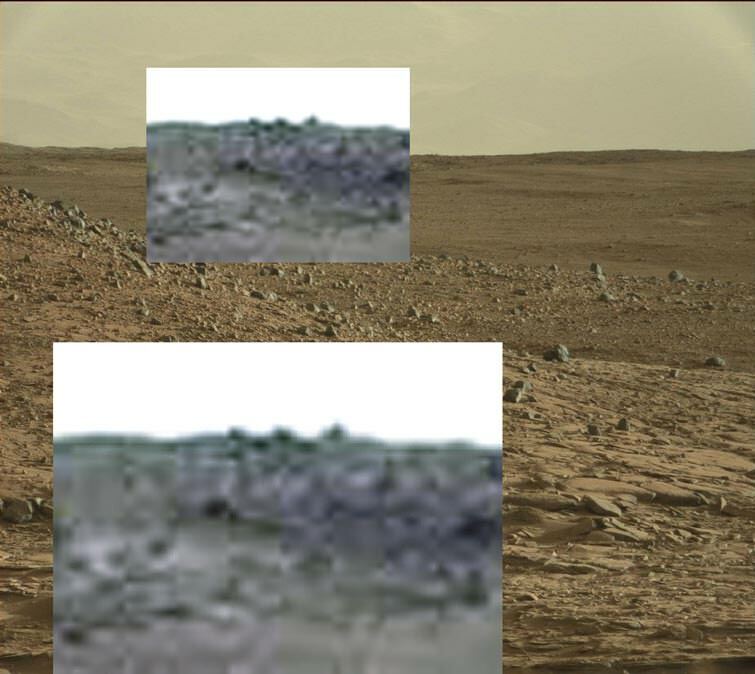 I didn't bother with the mobile phone one, since l have seen it before, l know one shot it is there, next it isn't like a local put it there for laughs, and then NASA says that the rover dislodged it earlier and it magically flung itself there even more so. Skeletons on Earth end up in all sorts of strange configurations due to savenging animals, wind, water, landslides etc etc. Rib cages are one of the first things to get distorted by the ravages of time.